Wisconsin’s oldest serving establishment, the Monarch Public House opened back in 1894. But beer was brewed on this site as far back as 1856, when Fountain Brew first started emerging from copper kettles. 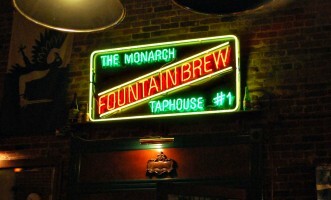 Fountain Brew continued until 1965, when the brewery closed. Resurrected in 1997, Fountain City Brewing brought back the original recipe and also brews up Prairie Moon Red, Eagle Valley Harvest Gold, Irish Valley Spring Bock, and John Robert Porter, an oatmeal stout and coffee porter. Housing the brewery, the Monarch Public House is also an Irish pub serving up a full menu including stone-fired pizzas; don’t be surprised to find live music there, too. Downstairs, the Rock Bottom Pub has emerged from what was the cellar, featuring the original bluff stone floor and a hand-hewn beamed ceiling. An outside patio in the back of the Monarch overlooks Highway 35 and the river. This is a great stop along the Great River Road!